A postcard depicting a view of the Baker Sanitorium from across Colonial Lake in Charleston, South Carolina. Colonial Lake is a tidal lake, with its surrounding park reserved for common use since 1768. The Baker-Craig Sanatorium, seen from across the lake, was founded in 1912, became the site of the Baker Memorial Hospital in 1963, and was converted into a condominium complex in 1981. "Baker Sanatorium (Charleston, SC)." SNAC. http://socialarchive.iath.virginia.edu/ark:/99166/w6r00qmd. "Colonial Lake Park." Charleston Parks Conservancy. http://www.charlestonparksconservancy.org/our_parks/view_park/colonial_lake_park/. 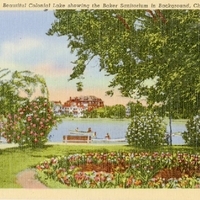 “Beautiful Colonial Lake Showing the Baker Sanitorium in Background Postcard.” RICHES of Central Florida accessed April 21, 2019, https://richesmi.cah.ucf.edu/omeka/items/show/6800.